Red Sun played at Croydon Warehouse, CR0 2NF March 17- April 4 2004! 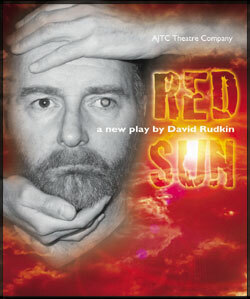 toured the world premiere production of legendary playwright David Rudkins thrilling new play Red Sun during autumn 2003. Pushed to the limit, an old man is forced to find a way to stop the oppression that is harming his people. Made out of clay and given life only through his anger, he creates a creature that will become the ultimate weapon - the ultimate force. But what has he unleashed on the world? Red Sun crackles with energy as the two characters confront their demons, and face the startling realities of power and freedom. Red Sun is directed by Geoff Bullen and designed by Maz Bullen. The company worked with leading movement artist Becky Edmunds and award-winning composer Dirk Campbell to create a piece of challenging and enlightening theatre. Click the venue title to visit that venue's web site, or click the post code to view a map- we hope to see you there!